The port of Leith has been chosen by Spanish company Gamesa for the site of a new wind turbine manufacturing plant. The £125m investment could create more than 800 jobs directly and hundreds more in the supply chain. The Edinburgh port was up against Hartlepool for the investment. Dundee had also been considered. The new factory is expected to make the enormous blades for offshore wind turbines as well as the generator units that sit at the top of the turbine. The decision is an important boost to the renewable energy industry, which has only one turbine-building site in Scotland. That plant, on Kintyre, has faced financial difficulties. With most turbines being imported into Britain at a time of rapid expansion in the sector, the growth of manufacturing is seen as important in harnessing the economic benefits. Offshore wind farms around Britain's coast could be the next growth area for the renewables industry. 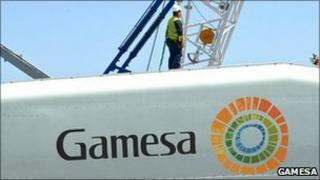 Gamesa already has a research and development centre in Glasgow and an offshore wind HQ in London. The wind turbine maker has signed a Memorandum of Understanding with Forth Ports over the Leith plant. The two will now work together in preparation for a longer-term agreement. Scotland's First Minister Alex Salmond described the news as a "welcome boost", bringing hundreds of quality jobs to Scotland's capital. He said: "I'm delighted that Gamesa has chosen Scotland and the fantastic Port of Leith as its preferred location for the manufacture of its new model of offshore wind turbines." Mr Salmond said he looked forward to the parties concluding the Memorandum of Understanding and moving forward. UK Secretary of State for Scotland Michael Moore said the decision was "a vote of confidence in Scotland and the whole United Kingdom". He said: "It reinforces the fact we have the skills to attract investment from around the world and that the UK government's commitment to the offshore renewables sector acts as an attractive prospect for business." Niall Stuart, chief executive of Scottish Renewables, said: "We have fought off incredibly strong competition from other parts of the UK for the location of the company's manufacturing facility, which is a fantastic addition to the growing list of major employers in renewables in Scotland. "This reinforces the massive benefits that renewables is having on our economy, and the role that the sector will play in getting out of the downturn and in getting the labour market moving again." WWF Scotland director Dr Richard Dixon said: "While other parts of the economy are sluggish or even going backwards the renewables industry is going from strength to strength. "This investment will create jobs and help reduce carbon emissions, making it excellent news for Edinburgh, for Scotland and for the environment." Charles Hammond, group chief executive of Forth Ports, said: "Today's announcement further secures the port's position as a key hub for the offshore renewables industry and is great news for Scotland and for the local economy of Leith."